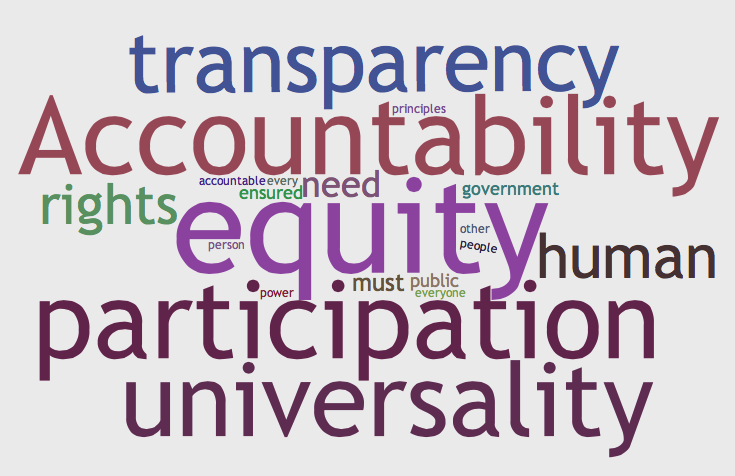 All of our work is guided by the following human rights principles (which we have adopted from the Vermont Workers Center): Equity, Accountability, Transparency, Universality, and Participation. Equity: Everyone puts in what they can and gets the care they need. Every person is entitled to the same ability to enjoy human rights. Accountability: It is not enough merely to recognize human rights. There must be means of holding the government and other power holders accountable for failing to meet human rights standards. Transparency: Government and other power holders must be open with regard to information and decision-making processes. People must be able to know how the public institutions needed to protect human rights are managed and run. Universality: Human rights must be afforded to everyone, without exception. It is by virtue of being human, alone, that every person is entitled to human rights. Participation: Government and other power holders must engage people and support their participation in decisions about how their human rights are ensured.